If you are up for a fun and exhilarating ride up and down the mountain sides then you can get the ultimate experience with Norco Fluid. The bike has a fluid alloy frame and weighs over 13 kilos. This bike is a little bit more expensive than some of the other trail bikes on the market. The Norco Fluid is the kind of bike that you are just excited to get outside and test it to your heart’s content. There is a reason that this bike inspires such a feeling. It really can seem to do no wrong. 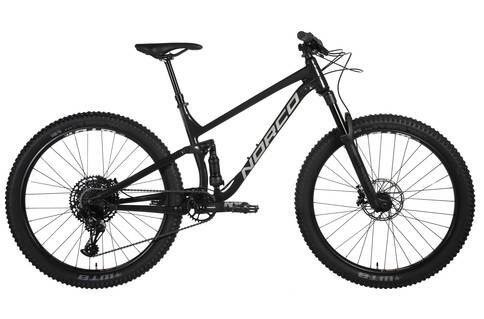 If you are looking for a trail bike to give you the time of your life then the Norco Fluid is your go-to bike. At first glance the Fluid seems like just another trail bike although we did admire it for its neat, compact structure. While it looks good, there is nothing on the surface that hints at what this trail bike is really capable of. We found this the second that we sat on this bike. There is no doubt that the structure is sturdy and durable. Despite this, there is also a hint of flexibility about it. We did not fully grasp the importance of this until we set off on the trail. Then, it suddenly became clear. If you have found yourself in a bit of unforgiving terrain this feature is incredibly handy at getting you out of it. Along those lines, we also found the handling to be top notch. It adds a great deal of control to the bike, making it a great deal easier to steer. This is something that you appreciate the rougher the landscape gets. It really does afford the Fluid a lot of power. To top all of this off, the suspension on the bike is really great as well. It really complements the overall frame of the bike, the two working beautifully together. If we had to pick a fault on this amazing bike, it would probably be its capacity for abuse. While the flexibility of the frame is appreciated, it does feel like it may impact its durability a bit. This bike is fully worth the investment – it is fun to ride, responds well, and performs beautifully on trails. All in all, there is very little to complain about with the Norco Fluid. It is definitely a valuable purchase.